I received product for review from Sony Pictures Home Entertainment. The opinions within this post are of my own and I was not influenced in any way. Please do your own research before purchasing products or using services. Your opinions and results may differ. Be the movie night hero and bring home the film that kids give two thumbs up to for the ultimate kid’s movie night! 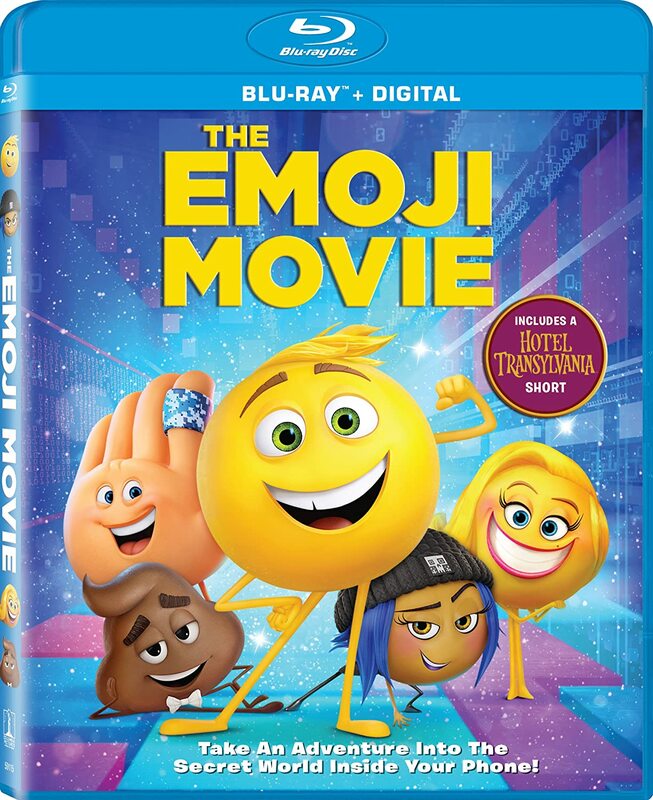 It’s time to express yourself when Sony Pictures Animation’s THE EMOJI MOVIE arrives for the first time on Digital on October 10 and on 4K Ultra HD+ Blu-ray + Digital, Blu-ray + Digital and DVD October 24 from Sony Pictures Home Entertainment. The animated comedy unlocks the never-before-seen secret world inside your smartphone. Hidden within the messaging app is Textopolis, a bustling city where all your favorite emojis live, hoping to be selected by the phone’s user. In this world, each emoji has only one facial expression – except for Gene (T.J. Miller), an exuberant emoji who was born without a filter and is bursting with multiple expressions. Determined to become “normal” like the other emojis, Gene enlists the help of his handy best friend Hi-5 (James Corden) and the notorious code breaker emoji Jailbreak (Anna Faris). Together, they embark on an epic “app-venture” through the apps on the phone, each its own wild and fun world, to find the code that will fix Gene. But when a greater danger threatens the phone, the fate of all emojis depends on these three unlikely friends who must save their world before it’s deleted forever. 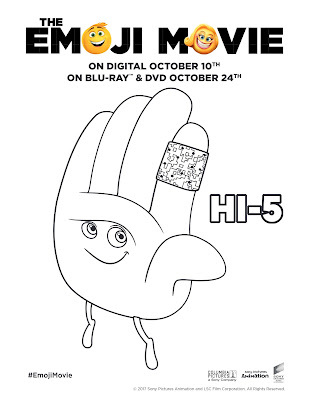 THE EMOJI MOVIE features an all-star voice cast including T.J. Miller (How To Train Your Dragon) as Gene Meh, James Corden (“Late Late Show with James Corden”) as Hi-5, Anna Faris (Cloudy with a Chance of Meatballs) as Jailbreak, Maya Rudolph (Big Hero 6) as Smiler, Steven Wright (Louie) as Mel Meh, Jennifer Coolidge (American Pie, Legally Blonde) as Mary Meh, Jake T. Austin (“Wizards of Waverly Place”) as phone owner Alex, Grammy® Award Winner Christina Aguilera as Akiko Glitter, Emmy® Award Nominee Sofia Vergara (The Smurfs) as Flamenca, Rachael Ray (“Rachael Ray”) as Spam, Emmy® Award Winner Sean Hayes (“Will & Grace”) as “Devil” Steven, and Emmy® Award Nominee Sir Patrick Stewart (X-Men, Star Trek: The Next Generation) as Poop. THE EMOJI MOVIE is directed by Tony Leondis, with screenplay by Tony Leondis & Eric Siegel and Mike White and story by Tony Leondis & Eric Siegel. The film is produced by Sony Pictures Animation, with Michelle Raimo Kouyate serving as the producer. THE EMOJI MOVIE has a run time of approximately 91 minutes and is rated PG: for Rude Humor. Emojis are an "in" thing right now. You can find them in all sorts of merchandise, and can choose from hundreds of them in apps and on social media. The Emoji Movie plays on some of our favorite emojis with a wacky and laughable film centered around Textopolis (aka, a Smartphone) that's owned by a boy named Alex. 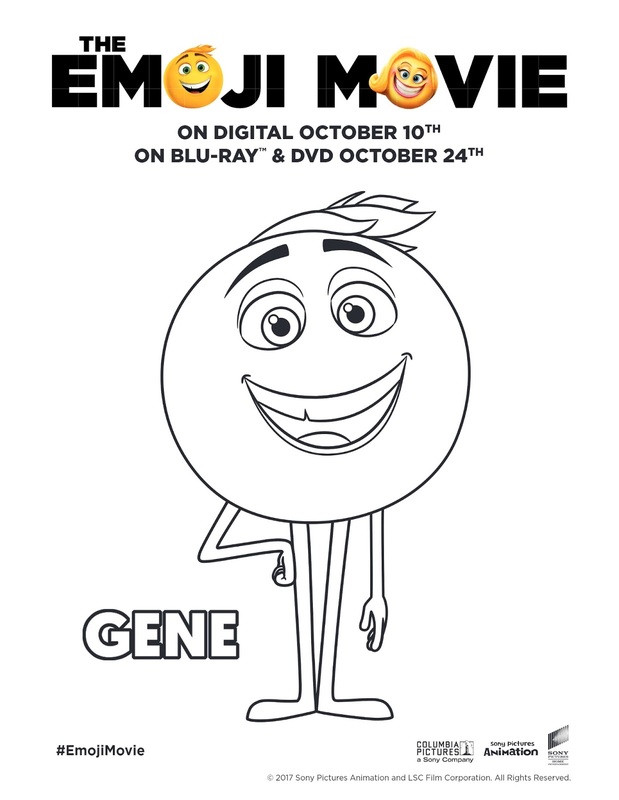 Gene, the "meh" emoji, is the only one of all who has more than one emotion. Because of his difference, Gene gets outcast and meets with other emojis who don't get used very often. Gene runs into a few problems, including a chase with robots. Alex, the phone owner, starts to get worried that his phone has a glitch in it because of all the apps and emojis doing their own thing which, in turn, causes a panic. 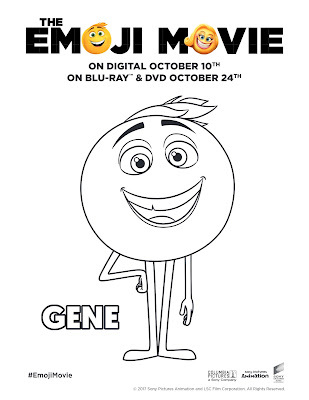 In the end, Gene gains some friends and he learns that it's okay to be different. I like the surprised emoji. I am surprised at a LOT of things people do. I like the winking emoji. My girls love the poop emoji! Well I just gotta have the poop emoji! Too funny! I like the smiling emoji. I use the eyeroll emoji quite a bit. i love the crying laughing emoji. it is the one i use the most. Not a big emoji user, but favorite apps are Stitcher, FB, and games. I like the little devil emoji. A favorite phone app I use often is Class Dojo to keep track of my grandson's behavior at school during the day, and I love seeing the pictures his teacher will post on the app, too. I love the emoji with heart eyes! My favorite is the heart emoji. I love the heart eyes emoji! This is such a fun gift set! YES! I do the laugh cry a lot or heart eyes! I like the poop emoji and the eye-rolling one. The like the emoji's with the red hearts for eyes and any of the smiling ones! my favorite emoji is the one that is smiling. I don't use emojis much. I'm a big fan of any of the smiley emoji's. My favorite Emoji is the one that winks and blows a kiss. I've always liked the heart emoji. I've always thought there should be a facepalm emoji, but I like the big grin emoji and my favorite app is Instagram. I love the winking emoji. Smiling is good too! I love the emoji with the cheesy smile!! My favorite emoji is the kiss emoji. I text members of my family frequently and use this emoji because I love them! The smiling emoji is my favorite. My favorite emoji is the laughing/crying face. My favorite app I use is Instagram. An app I use waaaaay too much is my Disney Tsum Tsum game app. I really need to get an adult hobby. My favorite emoji ss the smiley faces with heart eyes. From the movie I enjoyed the character jailbreak. My favorite is the winking emoji. Winking or smiling emojis are the ones I use the most! I love the heart eye emoji! I love the Poop guy. It cracks me up! I love the Mel Meh emjoi that always has a disgusted smirk on his face. As far as phone apps I spend most of my time on Facebook. My kids like the poop one. I like the heart emoji! My favorite emoji is the kissy face guy! I love emojis. My favorite is the laughing face. My favorite emoji is the laughing emoji! Makes me smile!! 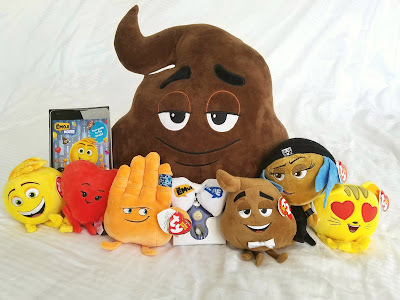 My daughter is obsessed with the poop emoji so I e really grown to like it!. The winking emoji is cool. I like several of them. They're cool. Hi 5 is my favorite Emoji! Our grandchildren would love this prize pack. Thanks for the super giveaway opportunity! My favorite (the one I use most often when texting my daughters) is the facing blowing a kiss. mine is the smiling tears one thats laughing, but my granddaughter loves them all. The heart eyes emoji is my favorite! My son of course loves the poop emoji. My fvaorite is the jack-o-lantern emoji because it is after all the most punpkinful time of the year. I love the heart emoji. It makes me smile. I use the laughing cry emoji the most! I mostly use the giant smiling emoji. I love the devil emoji. I like the laughing crying emoji and I use messenger more than anything on the phone. My favorite is the lol emoji. My favorite emoji is the one with hearts for eyes. I like the big teeth grin smiley. My favorite emoji is just the smiley face. I use it a lot because I'm always happy. Tried being miserable once, didn't like it. My girls love this movie.